It has been described as the world’s largest rubbish dump, or the Pacific plastic soup, and it is starting to alarm scientists. It is a vast area of plastic debris and other flotsam drifting in the northern Pacific Ocean, held there by swirling ocean currents. Discovered in 1997 by American sailor Charles Moore, what is also called the great Pacific garbage patch is now alarming some with its ever-growing size and possible impact on human health. The “patch” is in fact two massive, linked areas of circulating rubbish, says Dr Marcus Eriksen, research director of the US-based Algalita Marine Research Foundation, founded by Moore. Although the boundaries change, it stretches from about 500 nautical miles off the coast of California, across the northern Pacific to near the coast of Japan. The islands of Hawaii are placed almost in the middle, so piles of plastic regularly wash up on some beaches there. “The original idea that people had was that it was an island of plastic garbage that you could almost walk on. It is not quite like that. It is almost like a plastic soup,” Dr Eriksen says. 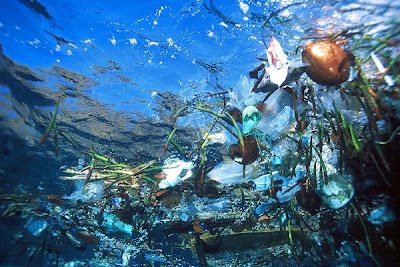 The concentration of floating plastic debris just beneath the ocean’s surface is the product of underwater currents, which conspire to bring together all the junk that accumulates in the Pacific Ocean. Moore, an oceanographer who has made the study of the patch his full-time occupation, believes there is about 100 million tonnes of plastic circulating in the northern Pacific – or about 2.5 per cent of all plastic items made since 1950. About 20 per cent of the junk is thought to come from marine craft, while the rest originates from countries around the Pacific like Mexico and China. Australia plays its part too, he says. The waste forms in what are called tropical gyres – areas where the oceans slowly circulate due to extreme high pressure systems and where there is little wind. The garbage in the patch circulates around the North Pacific Gyre, the world’s largest. A lack of big fish and light winds mean it’s an area of the Pacific less travelled by fishing boats and yachts. Moore says he discovered the floating mass of rubbish by chance, after steering his catamaran into the gyre while returning home from a yacht race. Historically, flotsam in the gyres has biodegraded. But modern plastics do not break down like other oceanic debris, meaning objects half a century old have been found in the North Pacific Gyre. Instead the plastic slowly photodegrades, becoming brittle and disintegrating into smaller and smaller pieces which enter the food chain and end up in the stomachs of birds and other animals. Because the plastic is translucent and lies just beneath the surface, it is apparently undetectable by satellite photos. “It is not like going to a parking lot after a rugby match. It is not like a landfill,” he says. “The material is breaking down continually. It is photodegrading all the time. It is what I call a kaleidoscope or an alphabet soup. You won’t see it from a satellite shot of the ocean. You only see it from the bows of ships,” he says. If the waste is to be controlled people must stop using unnecessary disposable plastics, otherwise it is set to double in size during the next 10 years, Moore warns. Dr Eriksen said the small plastic particles acted like a sponge to trap many dangerous man-made chemicals that found their way into the ocean, like hydrocarbons and DDT. “What goes into the ocean goes into these animals and onto your dinner plate, It is that simple,” Dr Eriksen said. Larger pieces of plastic are also a threat to birds, which mistake them for food. Dr Eriksen said he has found syringes, cigarette lighters and tooth brushes from the patch inside sea bird carcases. Professor David Karl, an oceanographer from the University of Hawaii, said the garbage patch represented a new habitat, and more studies were needed to find out what impact it was having on the ocean’s eco-system.